This has got to be the derpiest herp in the world! 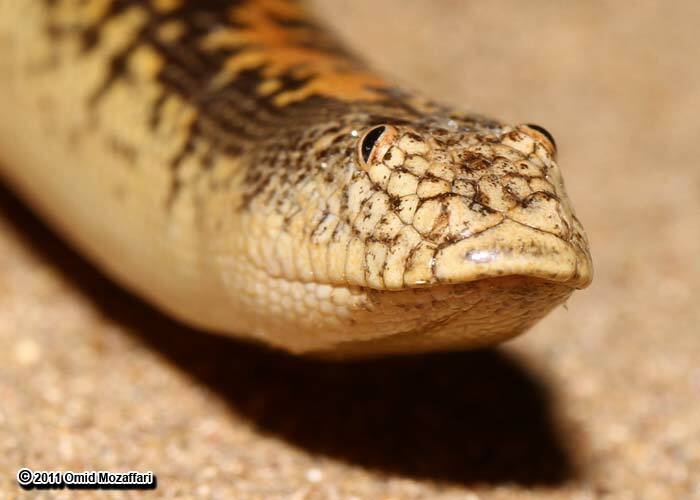 It's the profoundly uninspiring face of the Arabian Sand Boa. 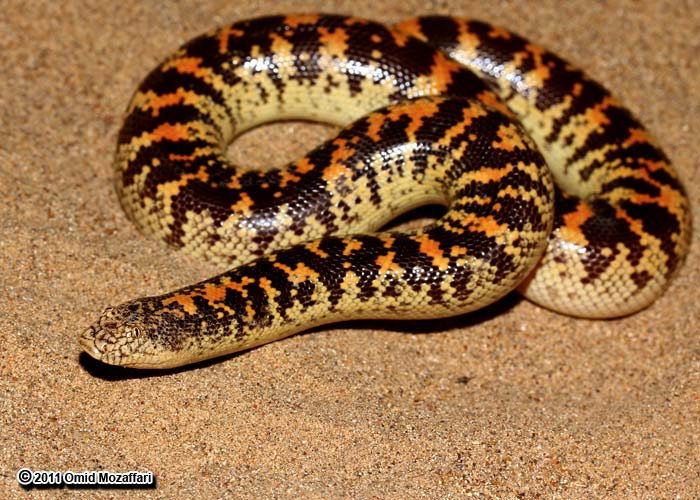 The Arabian Sand Boa is a kind of Sand Boa from the Arabian peninsular. A Sand Boa is a kind of boa. I'm trying to keep this simple but "boa" is already more than one syllable. It reaches a mere 40 cm (16 in) in length. That isn't the kind of size you usually think of when you hear BOA, but then Sand Boas are some of the smallest boas around. This particular doofus is common throughout much of the Arabian peninsular but seldom encountered because they spend almost all their time underground. It's a bit of a shame because they burn almost as bright as The Tyger. Their scales do, anyway. The brain might be a few lumps of coal short of a full furnace. Their ridiculous facial expression is not without its uses, however. The wedge-shaped snout allows them to carve their way through loose sand and soft soil, while their uncultured overbite keeps the sand out of their mouth. Smooth scales ensure they don't suffer too much from friction. But just beneath it. Their eyes, so implausibly positioned on top of their head, can now peer out from the sand while the rest of their body and even their face remains hidden from view. 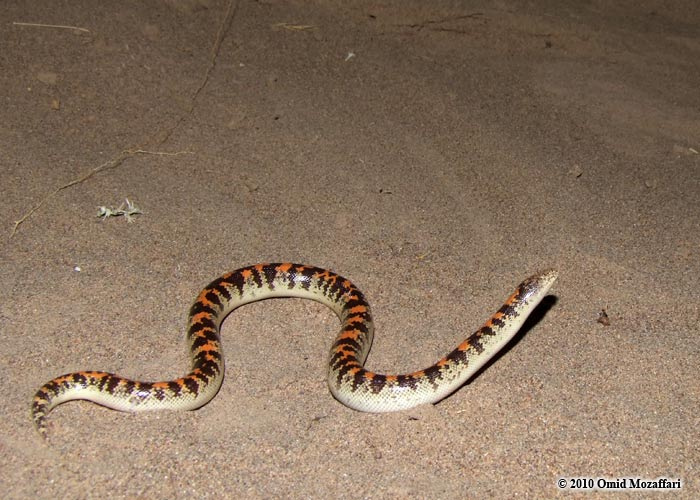 When a small lizard wanders by, the Arabian Sand Boa bursts out of the ground and bites it so that rows of small, sharp teeth can hold it in place (they're not as slack-jawed as they appear). Next, they coil around their prey and suffocate it before dinner. Gosh. So it turns out they're expert ambush predators! And all they had to do was look like a complete wazzock. It must be so embarrassing to get eaten by something that looks like such a plonker! 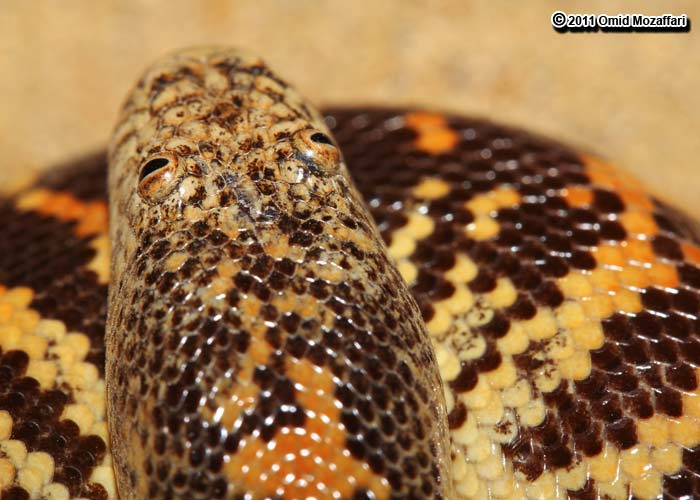 One odd thing about the Arabian Sand Boa is that it's one of just three or four species of boa that lays eggs. All the others give birth to live young. 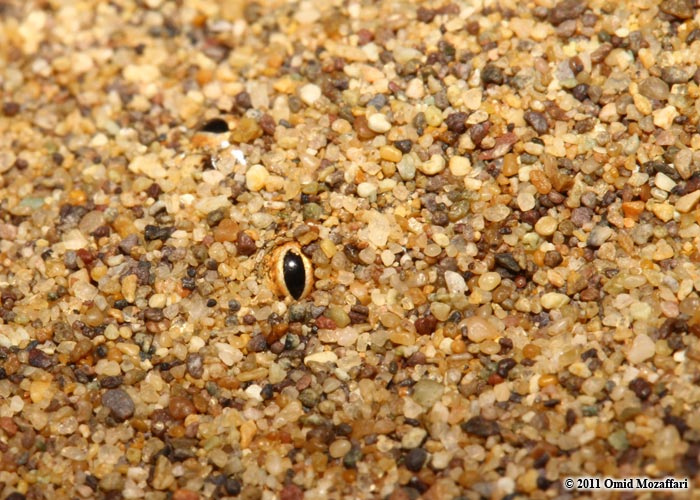 The Arabian Sand Boa lays about half a dozen eggs which hatch after two months two reveal adorable little snakelings. They still look like massive numpties, though. Wow. Just... look at that guy. Makes me wonder if Mr. and Mrs. Boa's milkman was a frog. Or maybe if Mr. and Mrs. Boa were brother and sister. @Crunchy: Ha! Nature is so unnatural! @TexWisGirl: Like the 'before' picture at a plastic surgeons! 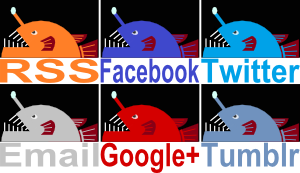 @Lear's Fool: That's the word! It's a good and noble word! @Porakiya Draekojin: It looks like it, doesn't it? Damn these sock puppets! I've got a female arabian sand boa and she's a derp. Really aggressive feeding response. Wow... I keep thinking she's got herself wrapped around an outstretched human hand. It seems so strange to imagine a face like that being aggressive!